Day 1: Parikoia, Paros - Ormos Dhespotiko, Antiparos W coast 12 nm We sail out on Saturday afternoon and we head for the South coast of Dhespotiko island. We swim at the magnificent beaches and end up for the night at the bay between Dhespotiko island and Antiparos. The bay is shallow (perfect for a catamaran) and very protected, even in the windiest conditions. We stay anchored and take the dinghy to the excellent and cheap restaurants on the beach. Do not miss the Gouna, sun dried mackerel on the charcoal. Day 2: Ormos Dhespotiko - Iraklia 24 nm We start the day with a swim at the caves in Ormos Dhespotiko, near by our anchorage. We continue to Iraklia and we visit the NW bay of Iraklia (36o 51.67' N 025o 27.59'E) where we can see the underwater remains of a WWII German airplane at 8 m depth. We dock at the bay of Ayios Yeorgios on Iraklia. Day 3: Iraklia - Amorgos 19 nm We sail south of the island of Antikeros and we head for Gramvousa Island next to Amorgos. We anchor there for a swim and we finish the day in Katapola port. One must definitely take a taxi ride to the monastery of Hozoviotissa on the E coast of the island. It is built on a steep cliff and the view from there is a lifetime experience. Remember to comply with the dress code if you wish to enter the monastery! Day 4: Amorgos - Pano Koufonissi 14nm A bit of blue water sailing in the unprotected channel connecting the two islands will take us to Pano Koufonissi. Head first for the bay on the NE (36o 56.66' N 023o 37.54'E) and stop there for a swim in the emerald waters. Spend the night on anchor at the main port. Attention: the port of Parianos is not big enough for the catamaran. Day 5: Pano Koufonissi - Kato Koufonissi - Schinoussa 7 nm Stop for a swim at Kato Koufonissi at the bay of Nero (which means water) and enjoy one of the best beaches in the area. Continue to Schinoussa and moor at the protected port of Mirsini. The main village is uphill but it is very well worth the walk up (or the ride if you ask a bypassing car). You can have dinner either at the port or at the village. Day 6: Schinoussa - Monastiri Bay, Paros 27 nm Upwind sailing (or motoring, depending on your patience) today. Our destination is the Monastery bay at the North of Paros Island. The bay is wonderful and very safe. 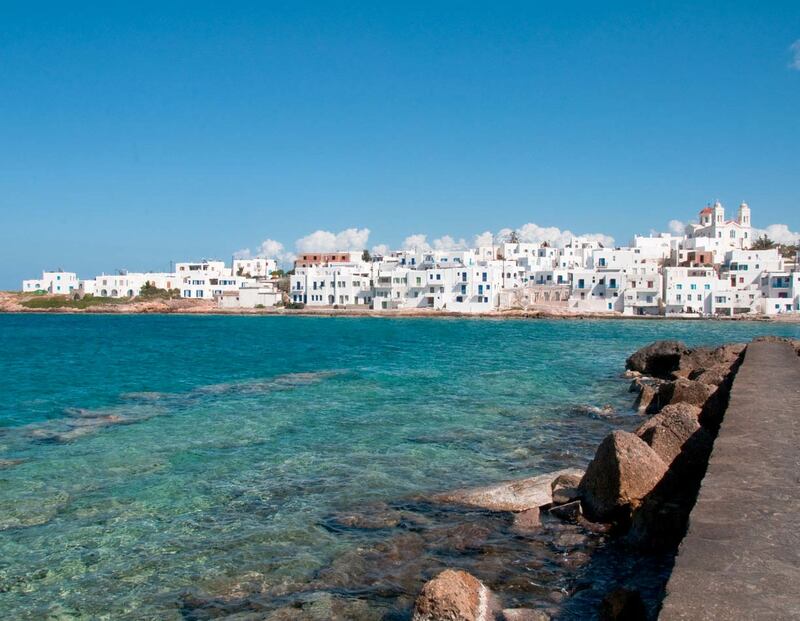 Alternatively one can use the port of Naoussa, the most cosmopolitan village of Paros and the best nightlife spot. Day 7: Monastiri Bay - Parikoia, Paros 9 nm After a swim in the bay and perhaps some water-sports at the local ski school a comfortable sail downwind will take us to our final destination, the port of Parikoia. The above described itinerary is invitational and the final decision should be based on the weather conditions and the judgment of the skipper.